Posted on November 2, 2018 at 9:30 pm. 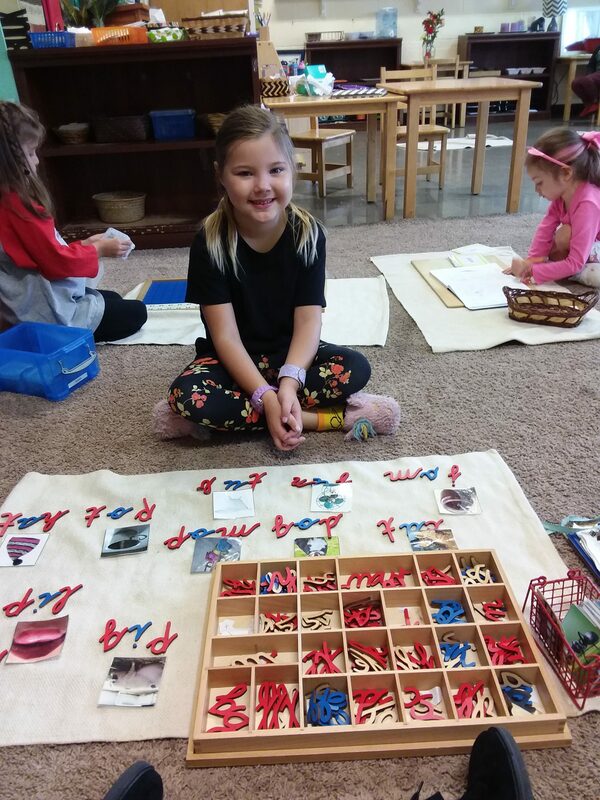 When working on the 9 tray the child becomes familiar with the different categories of numbers, especially with regard to reading the symbols . And also they are learning the wordings of large numbers. 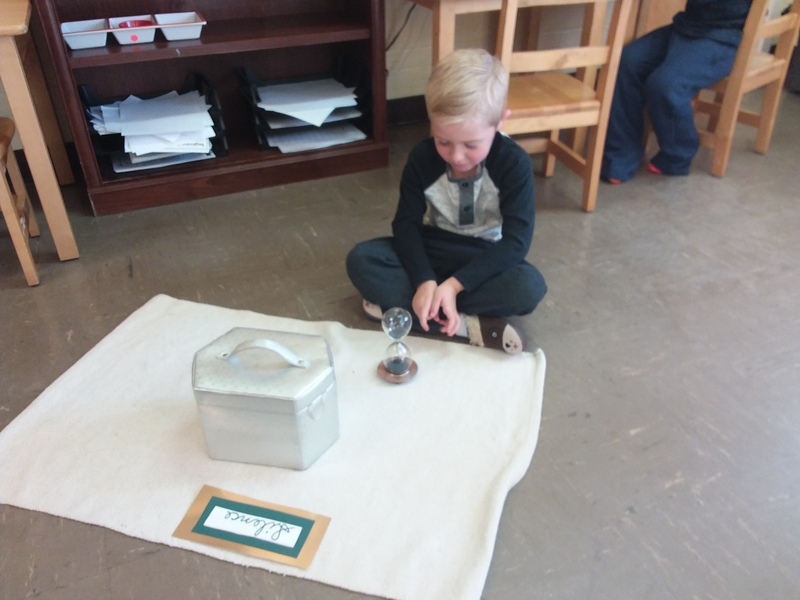 When working on Land, WATER, and Air the child will be able to classify and explore the elements of the Earth. 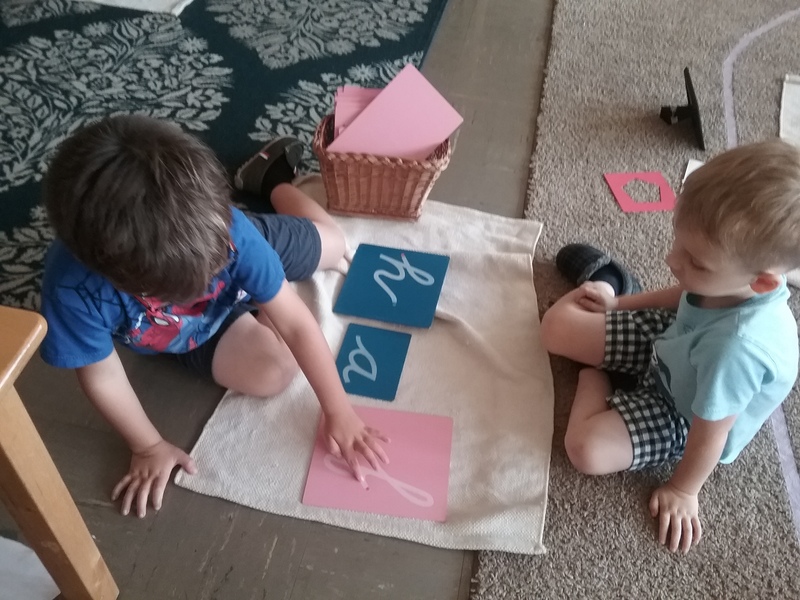 One of our older friends is teaching a friend our sandpaper letters. 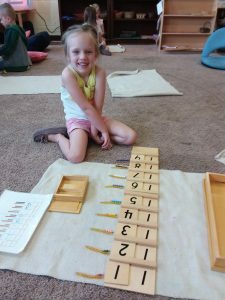 The sandpaper letters is to teach the child the sounds of the alphabet by means of muscular and visual memory. I hope all of you have a fantastic weekend!!! Posted on October 29, 2018 at 12:52 pm. 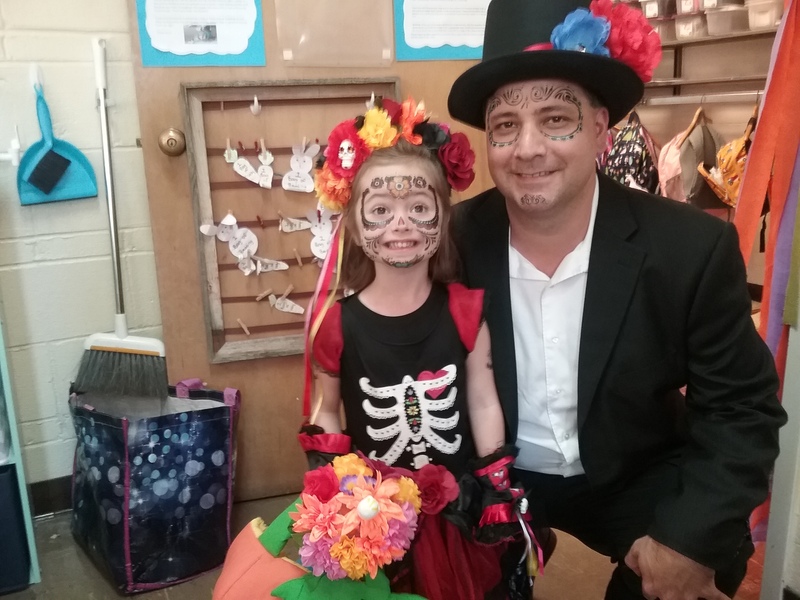 What a SPOOKY good time we had this week! 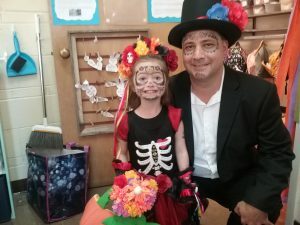 Our theme was all about Halloween! Everyday we read a Halloween book, and a craft that followed. We also had fun learning about how Halloween first got started. The kids had a blast decorating our classroom for the party!!! 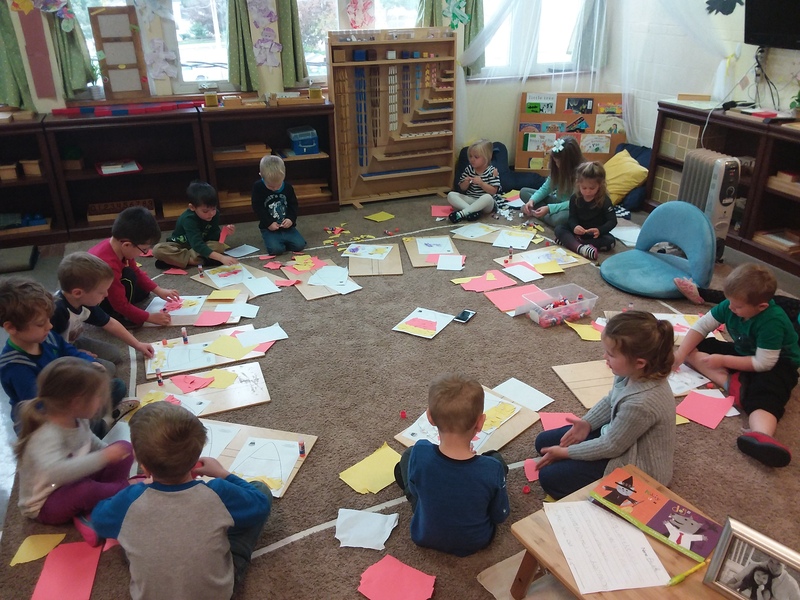 Our friends working on some Halloween crafts for our party! 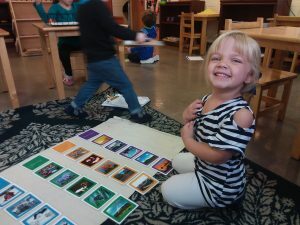 Our friend is working on the Four Seasons cards. 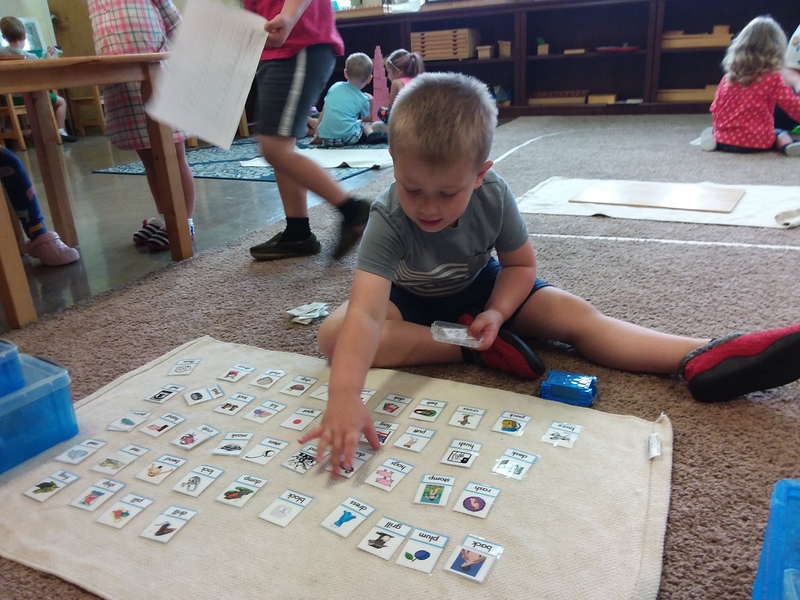 With this work not only are they learning the different seasons they are learning how to sort and categorize. 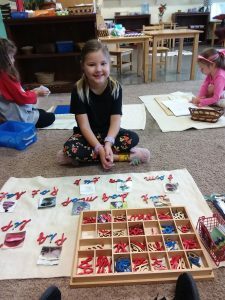 The Addition Snake game is such a fun way for children to begin memorizing addition facts. 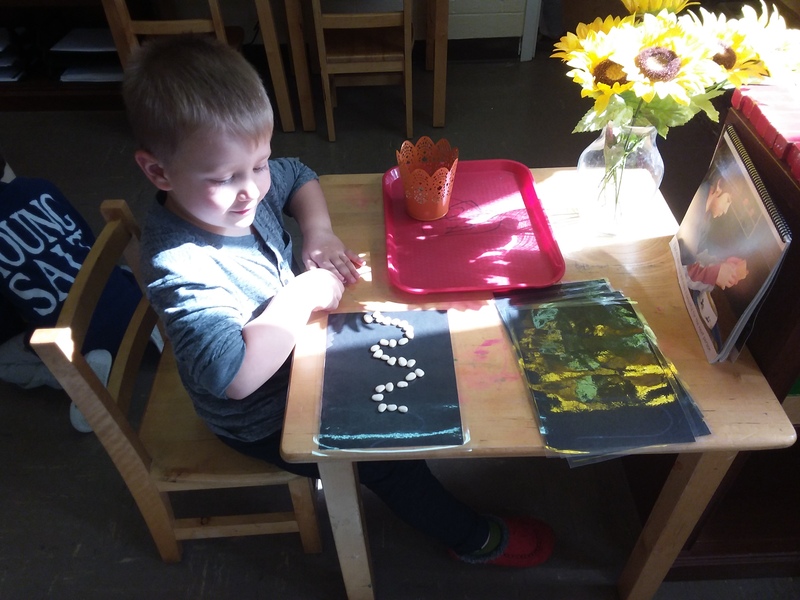 The goal of this work is to turn the colorful snake into a golden snake by counting to ten. The Addition Strip board is one method used by students to assist them in their abstract memorization of addition facts up to 18. We placed a new work on our shelves last week! 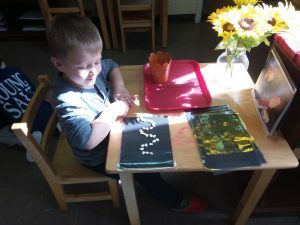 We drew our form drawings on black paper and the children were able to place beans on the lines that form the form drawing. 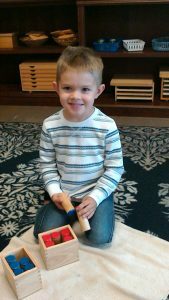 This work gains their fine motor skills, and helps to develop their pincher grip. I just wanted to say THANK YOU to all of my wonderful parents for helping and contributing to the Halloween party. It was a success!! Posted on October 21, 2018 at 3:10 pm. What a fantastic week we had!! Our theme was all about fall! 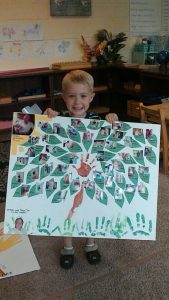 We had fun learning about the four seasons, acorns, leaves, what our favorite things to do in fall, chlorophyll, and more! 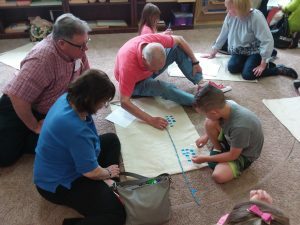 Your kiddos had a blast with different types of crafts, songs, and graphing activities! I absolutely love having a pet in our classroom. 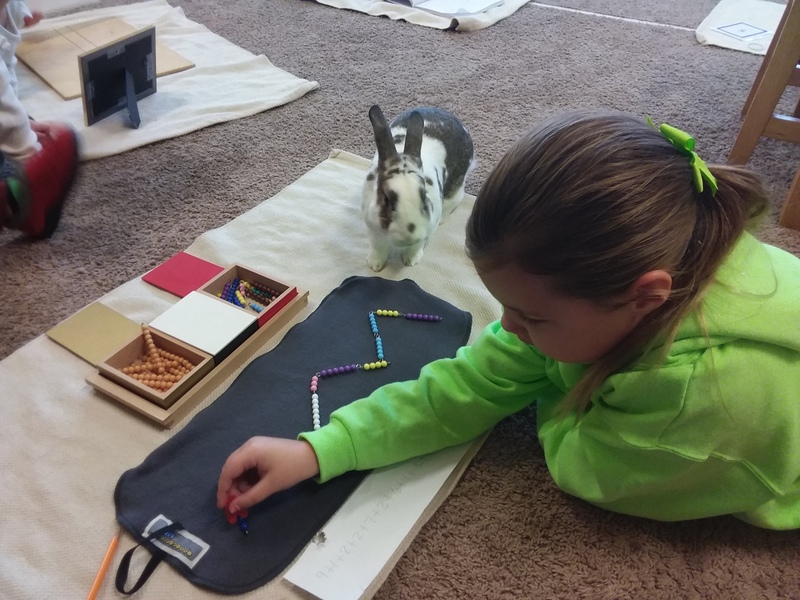 Here are just a few benefits of why having a classroom pet is such a great idea. 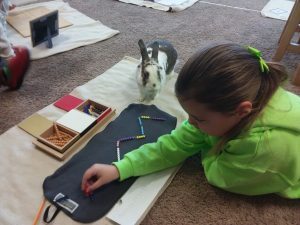 Pets provides new ways to learn, they encourage a nurturing attitude, it builds self esteem,and it teaches responsibility . This week Ms. Ame and I introduced how to make silence in our classroom. 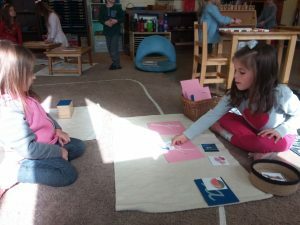 When making silence the children will develop concentration, precision, as well as social awareness, as they wait for a turn , without disturbing the classmate who is working. 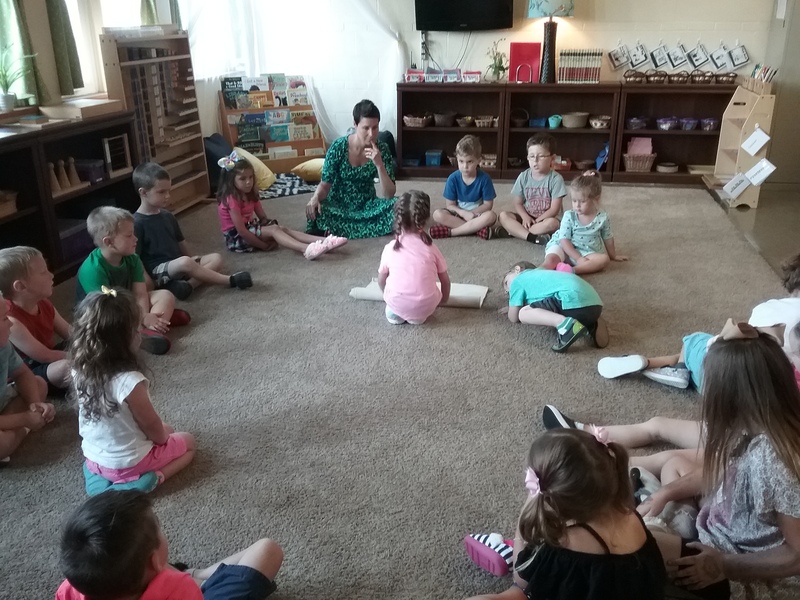 They learn to speak softly in response to the teachers quiet voice, and to stop moving and listen when our bell is rung or the lights are turned off. The children did exceptionally well with it!! 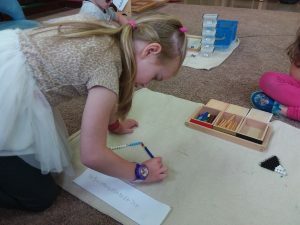 The sand tray helps promote writing success! 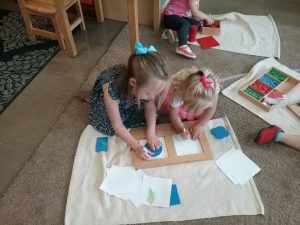 It’s purpose is to help a child learn how to trace letters and numbers on their own, while allowing for the same tactile and sensorial experience as the sandpaper letters and numerals. 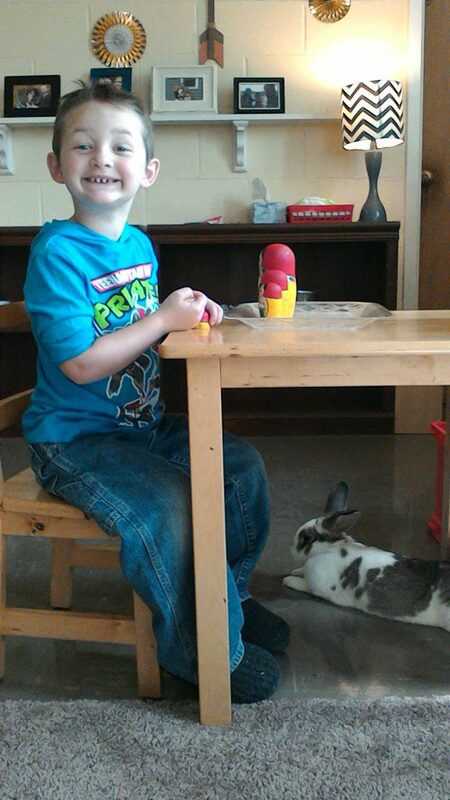 This week this cutie and I worked on object box number one with each other. This work teaches them that there is another way to communicate, helps them realize that a written word is a group of sounds represented by graphic signs and has a meaning. It is also an introduction to reading. Our Halloween party is this Friday! If you signed up to bring anything in, you can start bringing it in now! Book share is Friday! Please bring in any spooky books to share! Posted on October 11, 2018 at 4:53 pm. 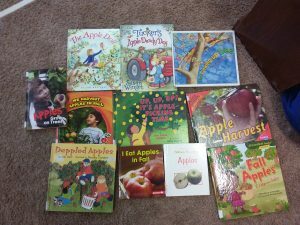 This past week we spent exploring everything we could about APPLES! Check out my video blog updating you on our classroom happenings for this past week. Click here! 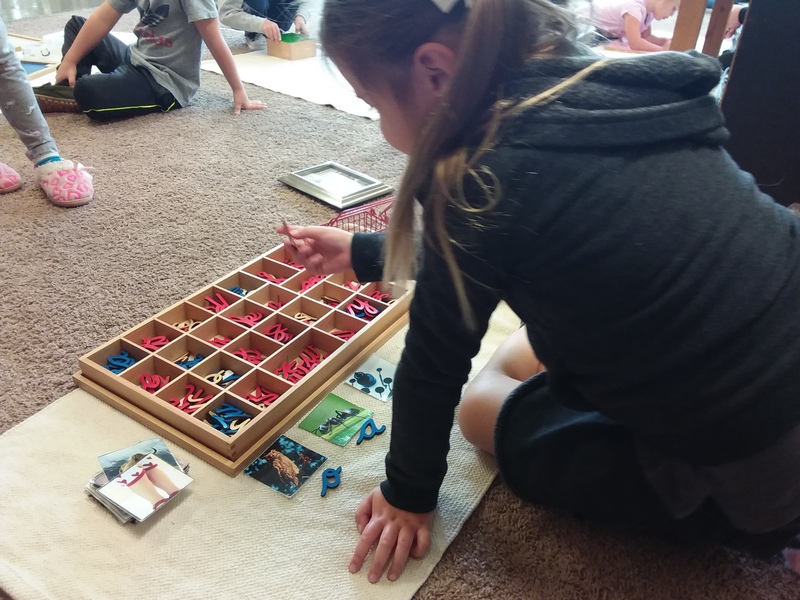 Our friend is working on color box three. When working on this material the child is developing a visual sense of color. 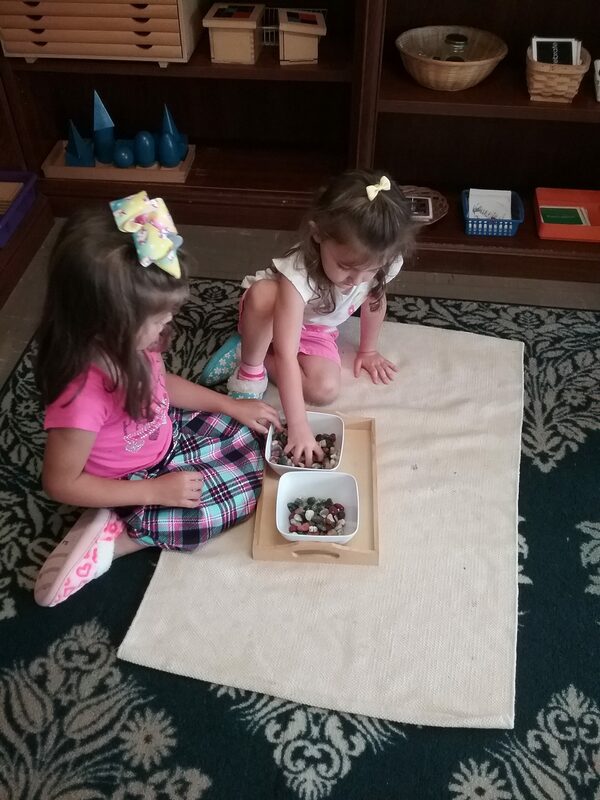 They are also gaining fine motor skills through the use of pincer grip. The trinomial cube blocks are color coded and are different sizes to represent the algebraic Binomial and Trinomail formulas. This is an introduction for algebra and preparation for the proof of the formula ( a+b+c)3 at elementary level. It also challenges the child to find patterns and spatial relationships. 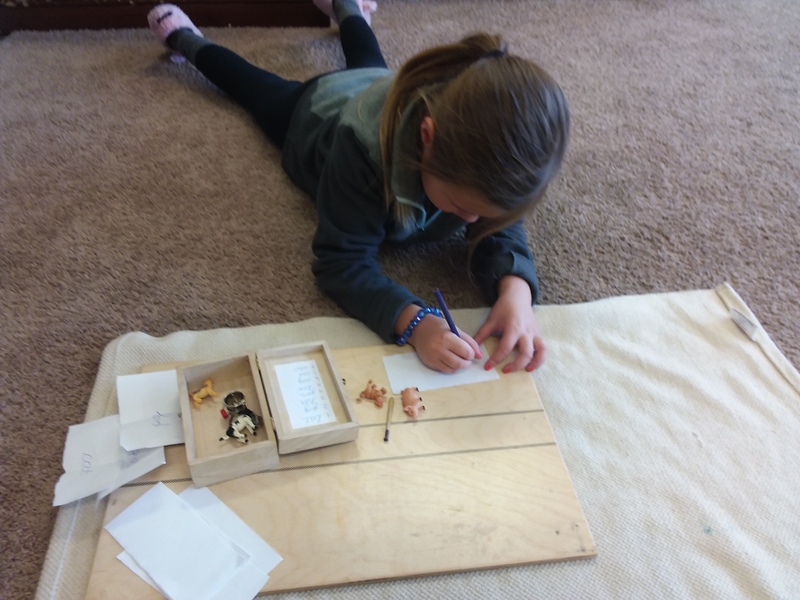 The movable alphabet helps with the analysis and exploration of the language which is known to him/ her and to reproduce words with graphic symbols. This works prepares the child for writing and reading. Today our friend was using our chalkboard to practice writing out the cursive letters. 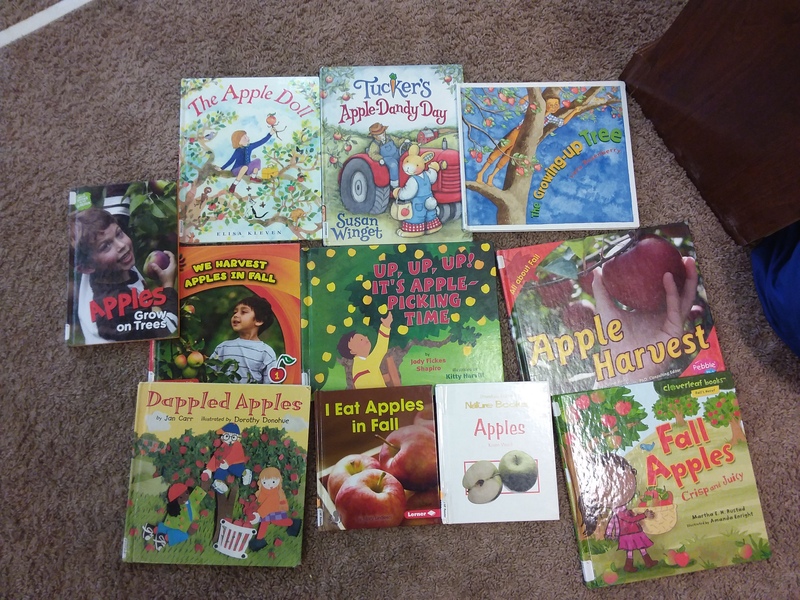 Here are the fantastic books we read!!! Posted on October 4, 2018 at 4:45 pm. 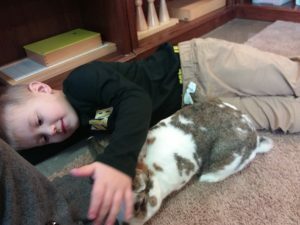 This blog is two weeks all wrapped into one!! 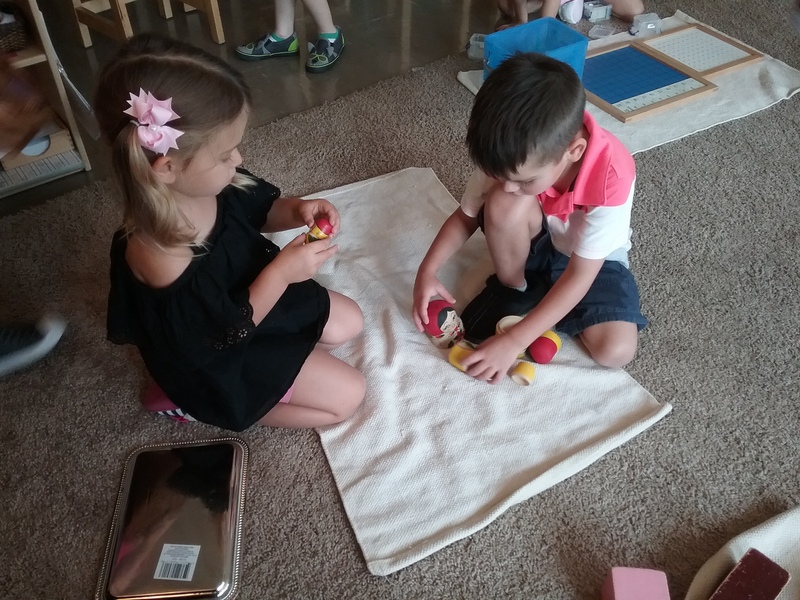 Last week was all about transportation. The kids had a blast with this theme..I mean who doesn’t love talking about cars, airplanes, and boats right?! All week we focused on what the word transportation really means. 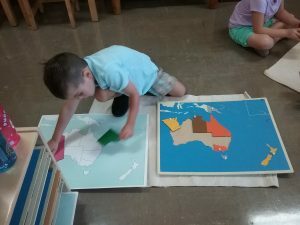 We also went over the different ways people get to places either on land, water, or air. 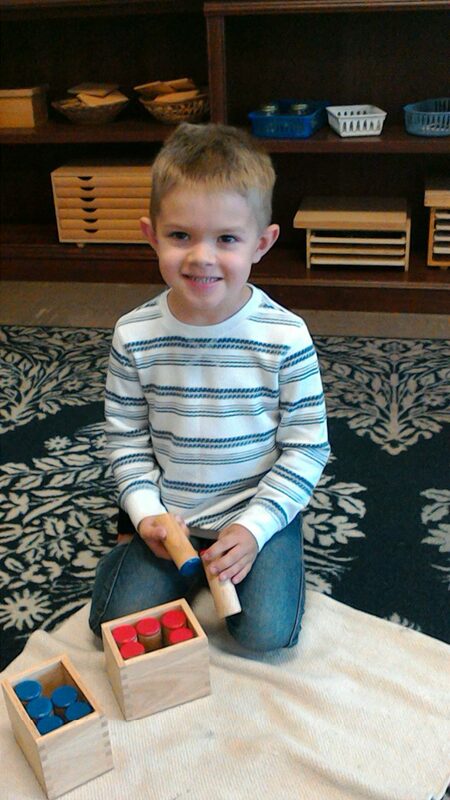 We had fun singing different songs on transportation and making crafts as well!!! This week was all about nutrition! 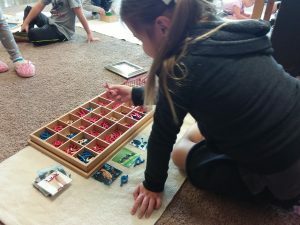 I was really proud of your kiddos because they got really into all of our lessons. We went over My Plate and what should be on their plate everyday. We also talked about how important it is to make your plate as colorful as possible. 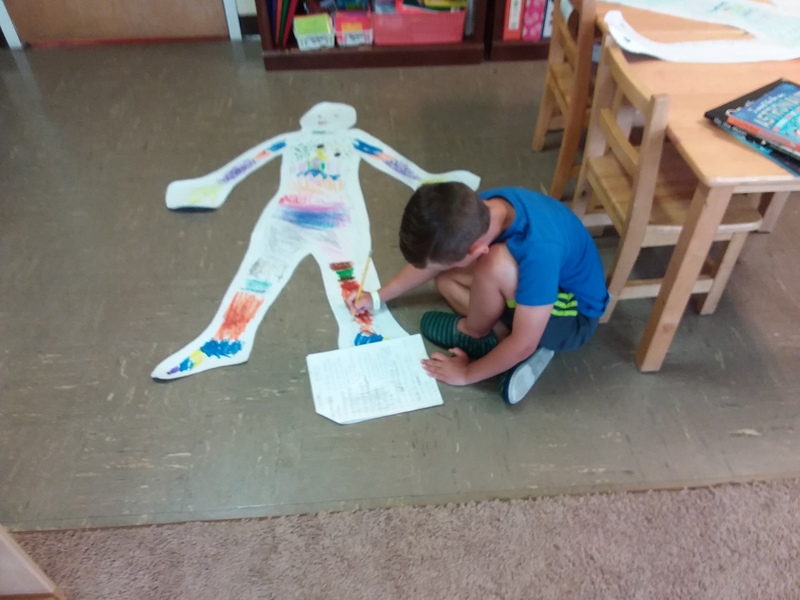 We also had fun learning about healthy foods vs. Non healthy foods. 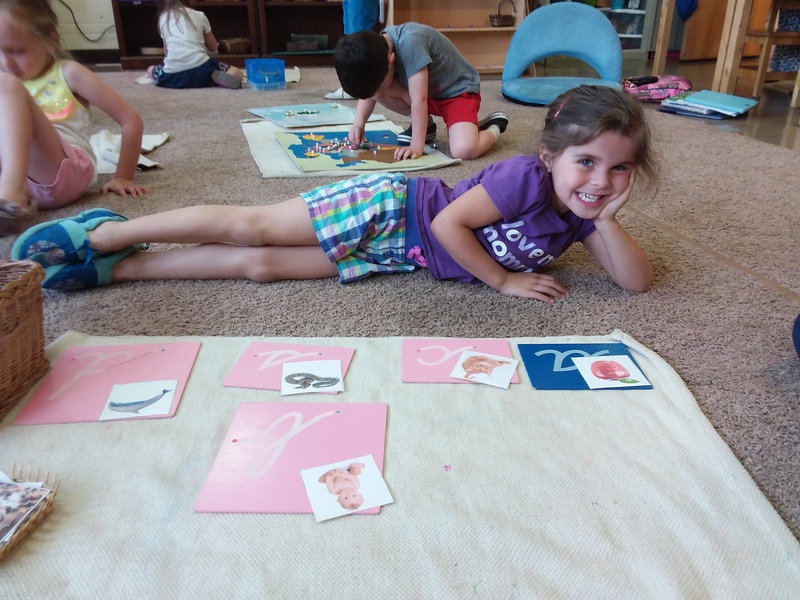 We sang songs about Nutrition, created a bar graph, and had fun crafts too!!! When working on our cursive movable alphabet it helps the child with the analysis and exploration of the language which is known to him/her and to reproduce words with graphic symbols. 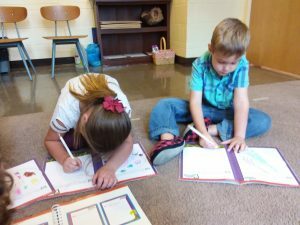 This work also helps prepare them for writing and reading. 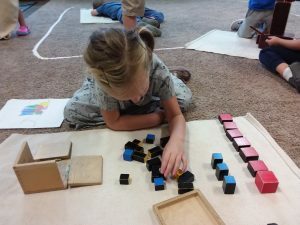 The trinomial cube helps prepare the child for mathematics. The cube of the trinomial is an introduction for algebra and prepares them for the proof of the formula ( a+b+c)3 at an elementary level. When working on our long bead chains the child learns other means of counting than by one by one. 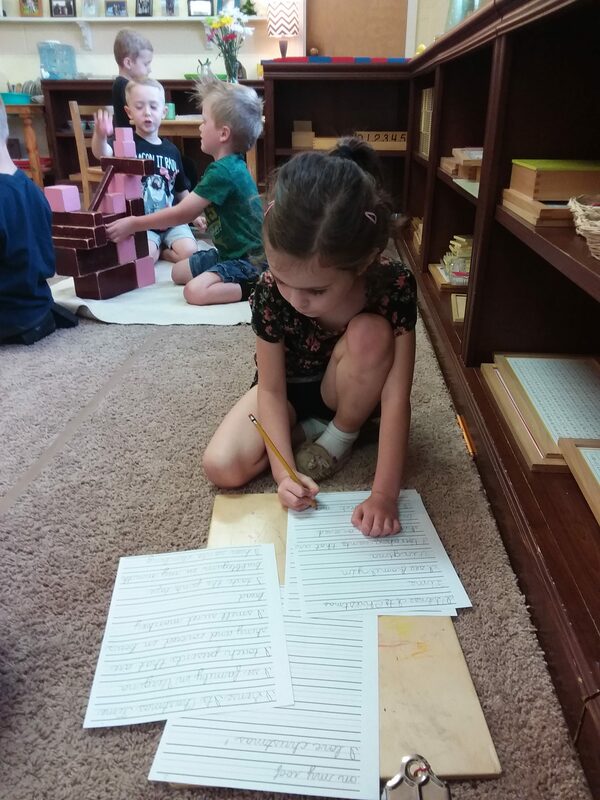 This work requires great concentration skills. 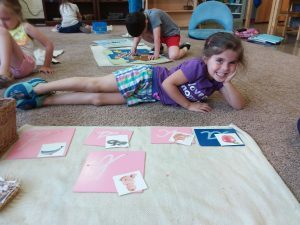 Picture to picture matching is such an important pre- reading skill. It’s helps children develop vocabulary skills as well as visual discrimination in a completely abstract way. 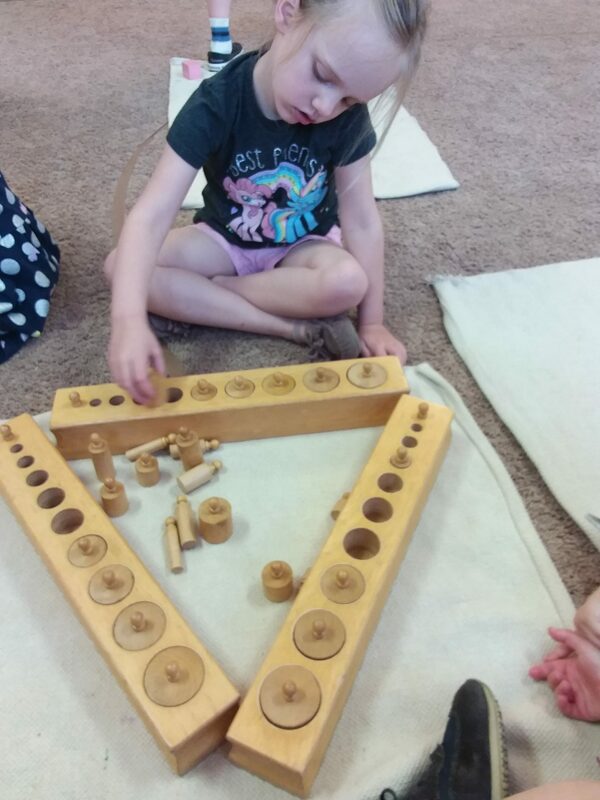 The geometric solids challenge and shape a child’s stereognostic sense, which is their ability to perceive and understand both the form and nature of objects through touch. 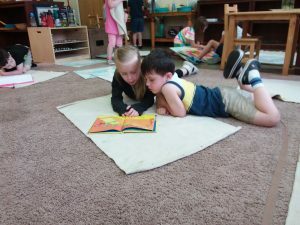 Book share is this Friday!! Next week we will be sending out sign ups for our Halloween party!! Posted on September 24, 2018 at 4:29 pm. 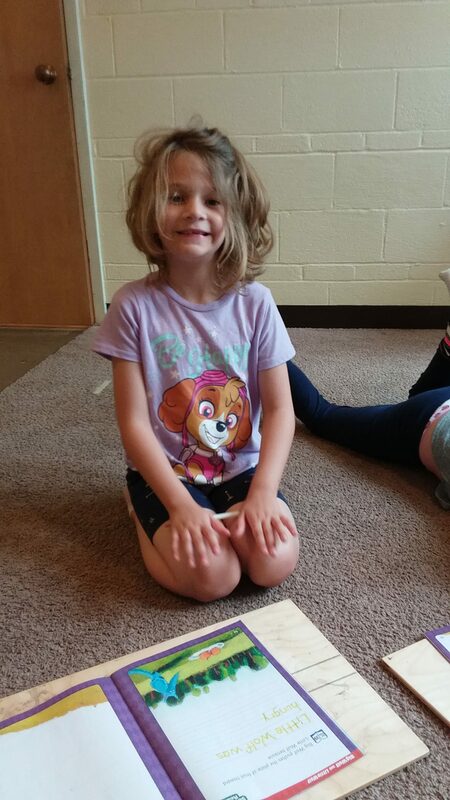 Oh my goodness what a fantastic week we had! This week was all about our families. We had some great discussions about how families are alike and different, what family means to them, who we live with, and more!! 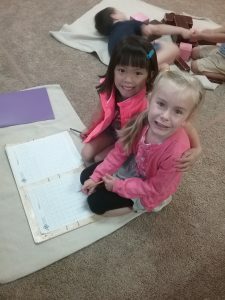 Ms. Ame had fun graphing activities, crafts, and awesome books that went along with our family theme!! 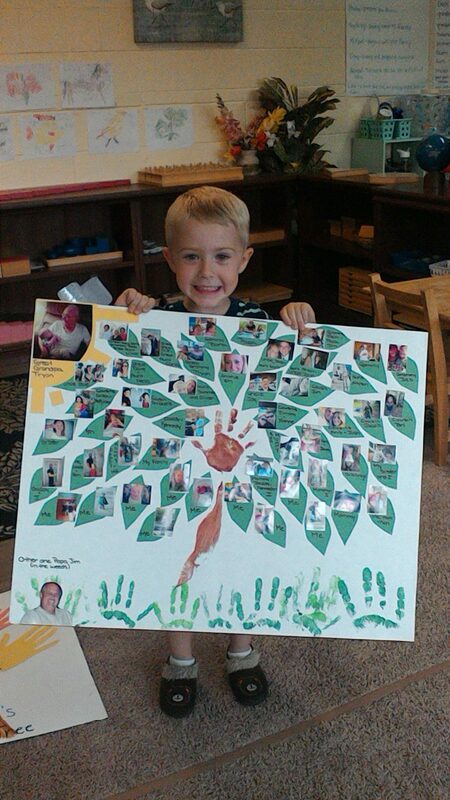 I want to say thank you to all my incredible families and my kiddos for making the most amazing family trees!!! 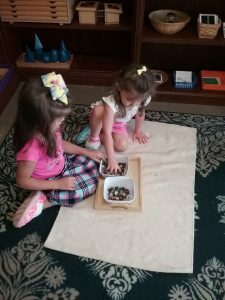 What I love about playing outside is that it sparks curiosity in children. 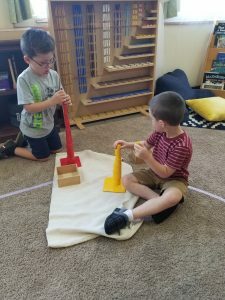 It helps them develop their gross motor skills, as well independence. Playing outside helps with brain development, as well as fosters their creativity. The purpose of our map puzzles are to provide the names and countries/states/provinces of each continent and the bodies of water that surround the continent. 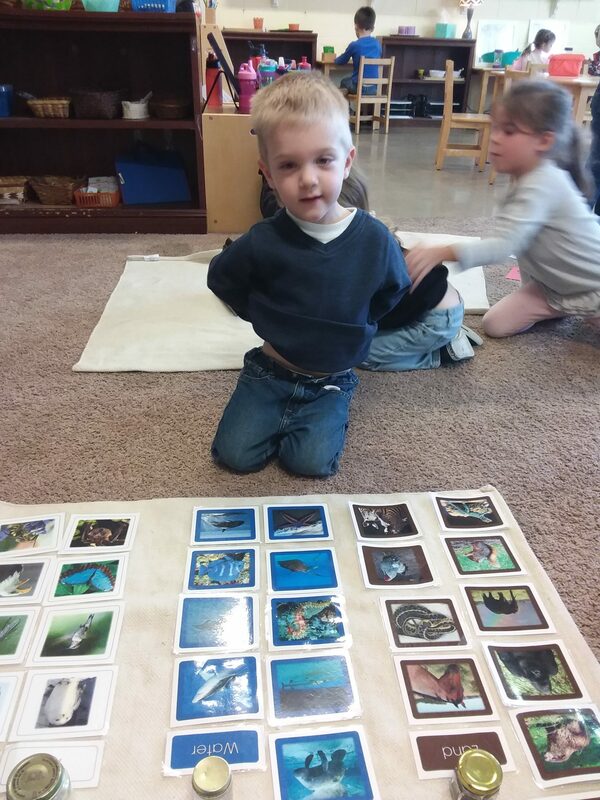 Our animal puzzles introduce the different names and parts of the different animals. When working on the puzzles it also helps build their fine motor skills. Our two friends are working together on our sandpaper letters. 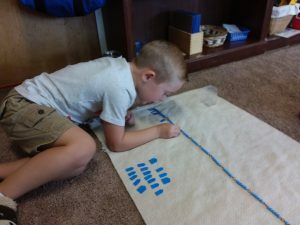 This work helps a child identify the sounds represented in graphic form. 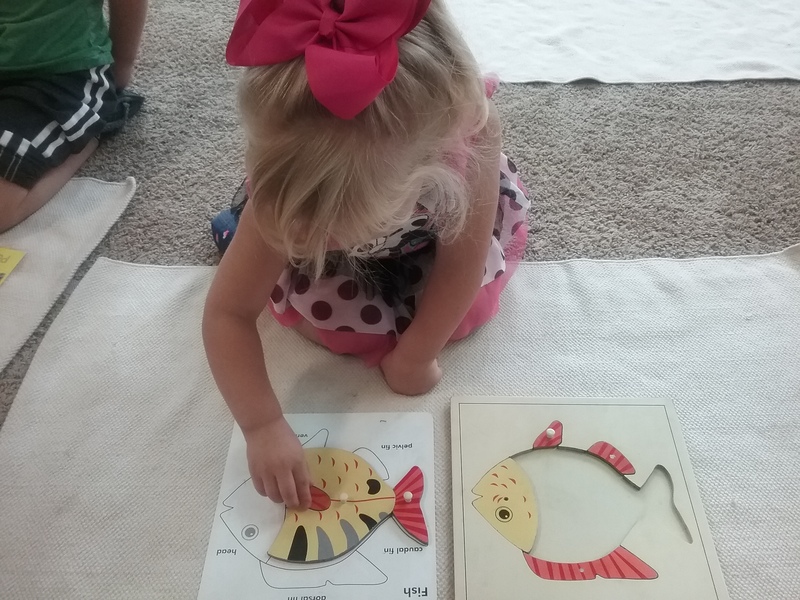 It also teaches a child the correct writing direction of the letter shapes. Posted on September 7, 2018 at 2:26 pm. Click on the below link to watch a video update about our week(s)! Our friends are practicing rolling and unrolling a mat! 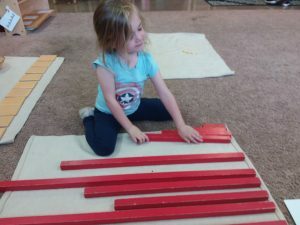 This helps with the coordination of movement, development of muscles, and concentration. One of our returning students is showing our new friend the knobless cylinders. With this work the child is to observe and compare the different series with each other. They are also getting a clearer understanding for the different dimensions and their interplay. These sweet kiddos are working on our grasping work. The purpose of this activity is to teach the child to carefully move items from one container to another. 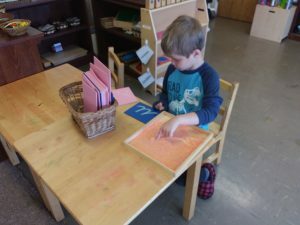 When working with the metal insets, it teaches the children to develop their pencil grip, refine their motor skills, and learn how to draw within an outline , which is the materials control of error. This work indirectly allows the child to practice concentration and order as they work with, and master the material. Please don’t forget to turn in your permission slips! Please bring in one baby picture next week! Posted on May 30, 2018 at 5:26 pm. I can’t believe that this is our last classroom blogI have to say that this has been an incredible year! 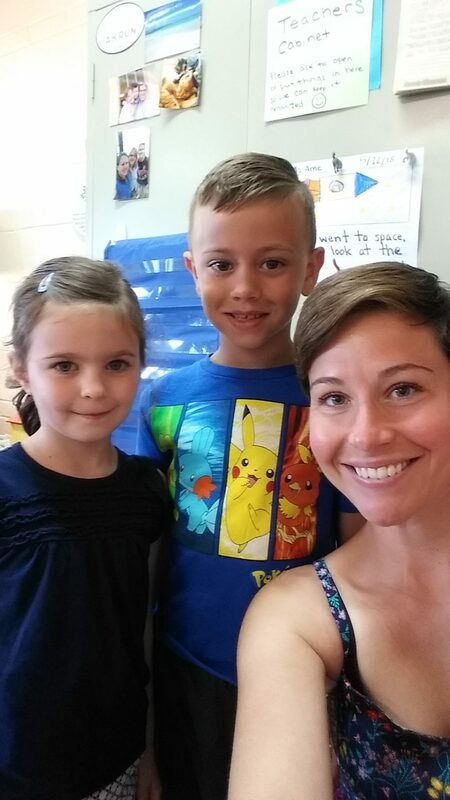 I am just so fortunate that I was able to watch your kiddos grow into such great, loving, and kind people. I am truly going to miss seeing their faces, watching them be silly, and seeing their amazing smiles. Also, thanks to you too for being such awesome and wonderful parents. It’s also sad to say goodbye when I’ve made some pretty incredible friends. I hope all of you have a wonderful and safe summer! I am going to miss these two so much!! Our friend is working on the sandpaper letters. The consonants are mounted on the pink wood, and the vowels are mounted on the blue wood. 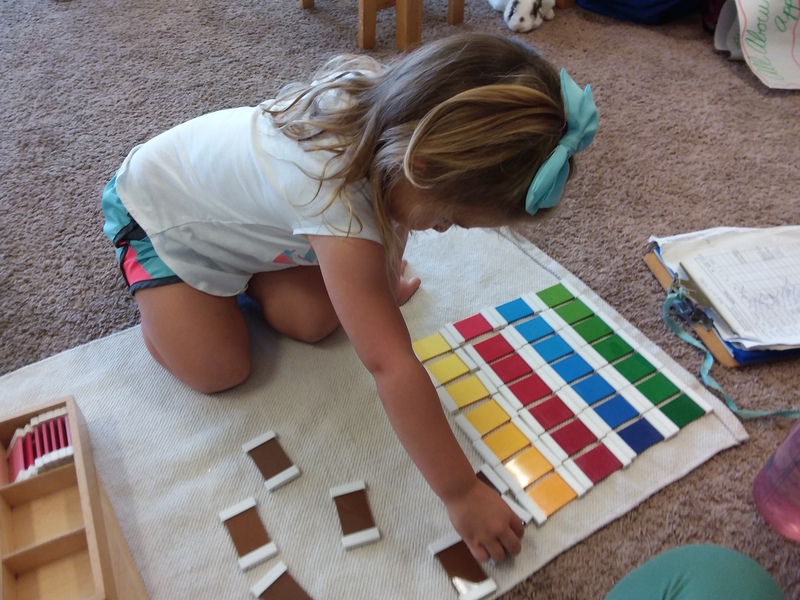 This work teaches the child sounds of the alphabet by means of visual and muscular memory. 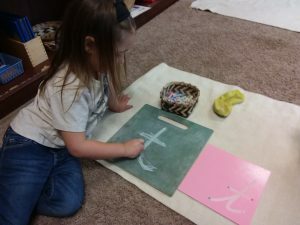 The child is encouraged to trace the symbol over and over again until the shape of the letter becomes part of the child’s muscle memory. The teen board associates the numbers eleven through nineteen with the symbols 11 to 19. 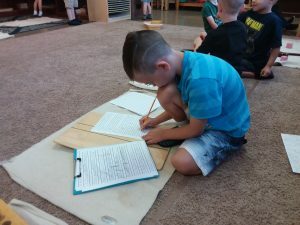 Our kindergarten student is working so hard on his shape poem. Have a wonderful summer!! Please come back and visit!! Posted on May 18, 2018 at 1:42 pm. This week was all about community helpers. On Monday the kids took a field trip to the fire station. They had a blast learning about fire safety, seeing behind the scenes at the station, watching a firefighter put on his turnout gear, and more! It was a great field trip. 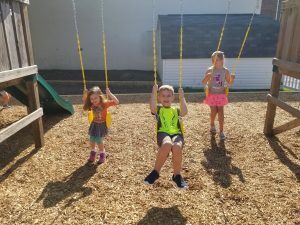 We also talked about the different community helpers that we have in our neighborhood, and how they make an impact on all of us. This week we also celebrated grandparents day!! 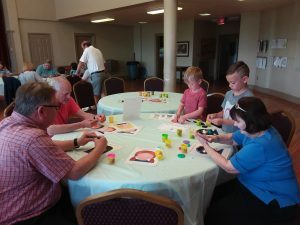 It was amazing watching the grandparents and their grandchildren interact together, it was super special. 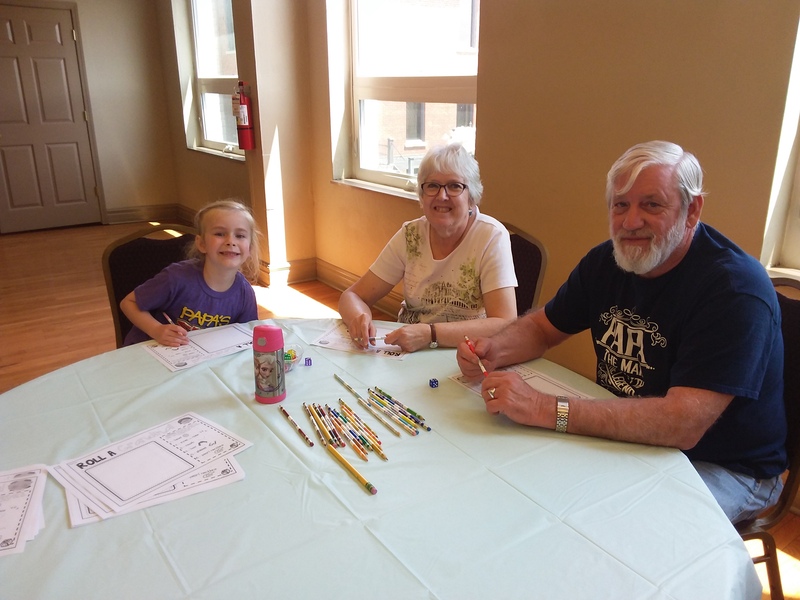 Such a great time at grandparents day!!! 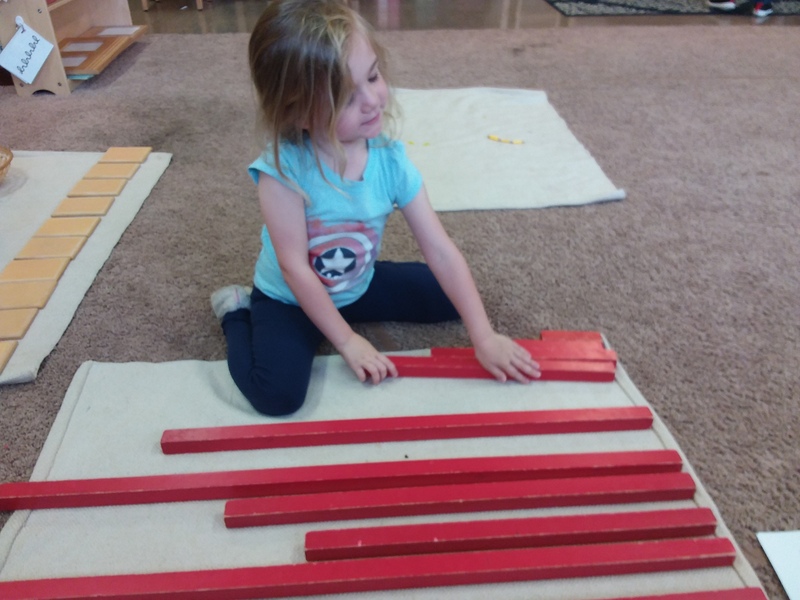 The purpose of the red rods is the visual discrimination of differences in dimensions, and the muscular memory of length. 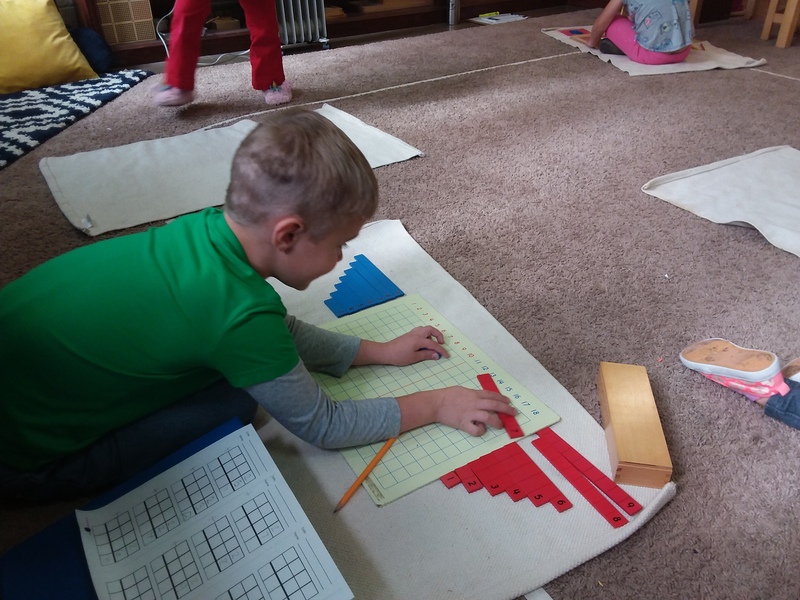 This work also prepares them for mathematics. The direct purpose is to observe and compare the different series with each other. 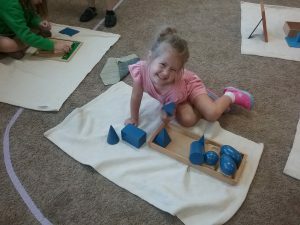 The indirect purpose is for them to get a clear understanding for the different dimensions and their interplay. 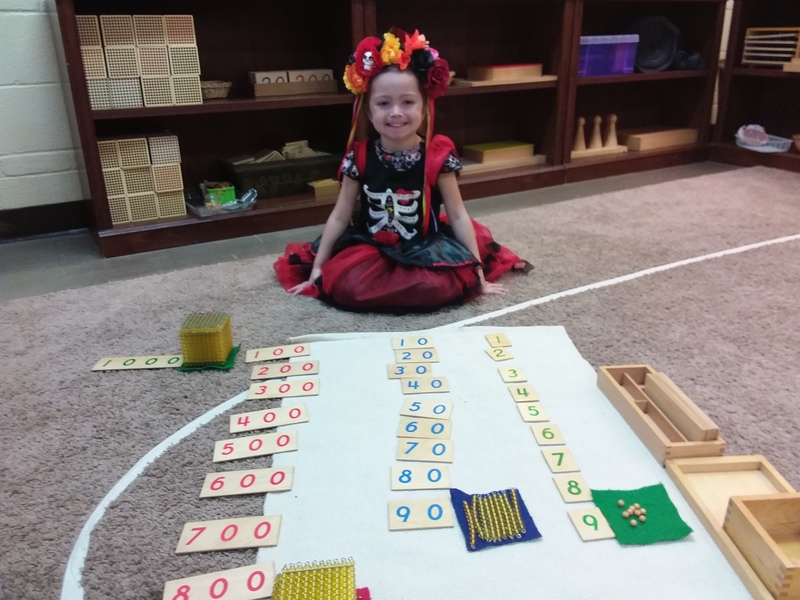 While working on the addition snake game the child is to familiarize with all the possible number combinations that make up ten. They can also aquire a subconscious knowledge that no two numbers together amount to more than 18. This gives practice in getting the first basis of memorizing the essential combinations with which, when known, one can make any addition. 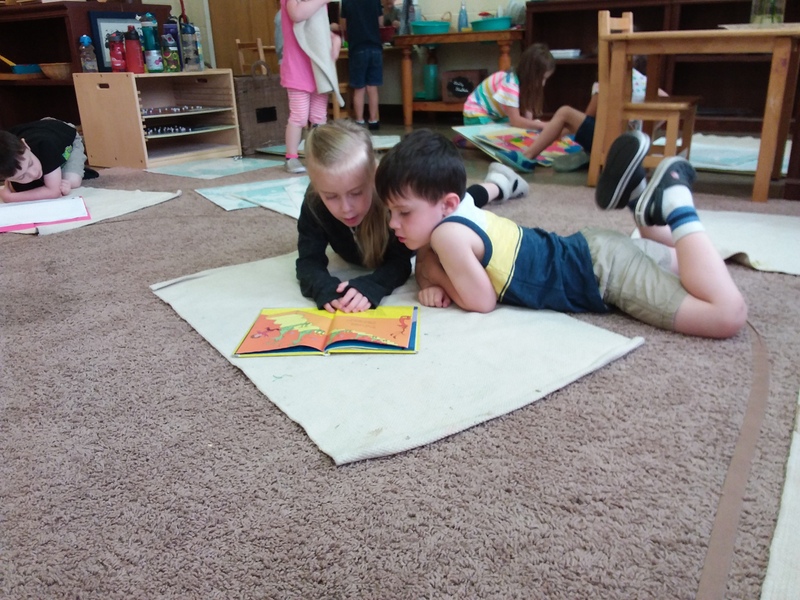 Our two kindergarten friends preparing for graduation! Next week is all about outer space. We will have fun learning about our 8 planets, the sun, moon, and stars, the space shuttle and more! Next Friday is our zoo field trip!! !